Licensed to produce Aéropatiale's SA 365N Dauphin II helicopter on 2 July 1980, the Chinese government approved the license in October and tasked the Harbin Aircraft Manufacturing Company (HAMC) and SAEC at Zhuzhou with production of the airframe and engine, respectively. The twin-engined helicopter has retractable tricycle landing gear and a flight crew of one; the maximum passenger capacity is nine. Maximum internal and external payloads are 2,038 kg and 1,600 kg, respectively. 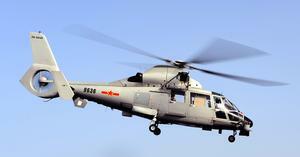 In China the helicopter was redesignated Z-9 Haitun and the engine (Turboméca Arriel IC1) as the WZ8A. The Harbine Engine Factory (HEF) manufactured the drive train; rotor blades were subcontracted to Baoding Propeller Factory. The first 28 helicopters were assembled with French manufactured CKD kits. Resources related to the Z-9 Haitun, provided by the Vertical Flight Society. Resources related to the Z-9 Haitun, provided by public sources across the internet.